This series of workshops will help you become a better searcher and information user. Designed to be practical skill-building lessons that will improve your scholarship and research habits. 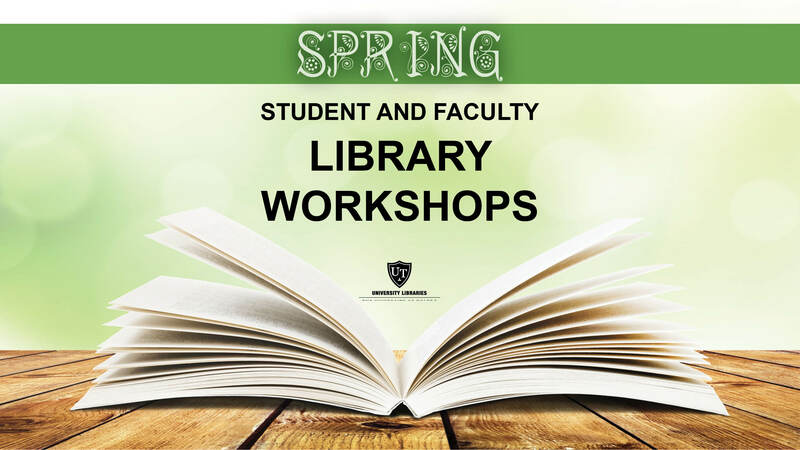 Spring is here and it is time to renew and brush up your research skills! Do you have a major project or presentation approaching? Graduating soon and on the career path? The Library is your one stop shop with weekly workshops during January, February, March and April! Your UToledo librarians are here to assist you--whether you are an undergraduate or graduate student--in your research success. A primer for graduate students and faculty members seeking a refresher on properly attributing credit to sources. Includes a discussion on the importance of attribution, the difference between citation and attribution, the sometimes subtle distinctions between the attribution and copyright of intellectual property, an introduction to the various citation style manuals, and an introduction to the creative commons licenses. Correctly citing all of your sources for your research is an important part of being an ethical researcher. When you have a big paper, thesis or dissertation, the EndNote program can help! Working on a project or major paper? Do you feel overwhelmed thinking about research? Equip yourself with the essential tools and resources necessary to tackle any assignment and feel confident knowing where to search. The government holds a wealth of information relating to the education of our children and the training of our teachers. Learn the main types of information that support the research and practice of K-12 education. Through the University Libraries, learn what the U.S. Department of Education can provide, what the U.S. Census can provide, and how to navigate some of the state of Ohio’s pages. Useful Links/Guides: Government Information Another LibGuide TBA! Overview of library resources and services for graduate students in Engineering.